Joint Ventures or Securities – What’s the Difference? Are you selling securities or joint ventures? Will investors invest money in a common venture with you? Do your investors have an expectation of profits based solely on your efforts, skills or experience? If the answer to both of these questions is yes, then you are selling securities and you must comply with securities laws. Conversely, if the answer to the second question is no, then it may be a joint venture. If your investors are actively involved in managing the project along with you, it may be a joint venture, but if they are passively investing money with you, then you are probably selling securities. If you have determined you are selling joint ventures, you are not home-free, as joint ventures still require a Joint Venture Agreement, and a clear and written understanding of who will perform what tasks, and how each JV partner will be compensated. Additionally, joint ventures have some drawbacks for both you and your investors. So what if you are selling securities? Federal and state definitions of “securities” include the term “investment contract.” The definition of an investment contract is “an investment of money in a common enterprise, with an expectation of profits based solely on the efforts of the promoter” (Securities and Exchange Commission v. W.J. Howey Co., 328 U.S. 293—1946). This is called the four-prong “Howey Test.” A typical investment contract may be an operating agreement for a manager-managed limited liability company, a limited partnership agreement, a corporate shareholder’s agreement or a trust agreement with multiple beneficiaries. In each of these entities, there is a “management group” and passive investors. The sale of securities (i.e., investment contracts) must be registered (pre-approved by securities regulators) such as in a Regulation A+ offering, or a public offering, unless exempt. To follow a securities exemption, the “issuer” of the securities (aka the promoter, manager or syndicator) must first decide which exemption is applicable and then have the appropriate documents drafted and follow the rules for the exemption. Typical rules for securities exemptions may include advertising restrictions, limits on who can invest (financial or geographic) or limits on the number of investors, and they usually require disclosure of the risks of the investment. Under securities laws, the issuer has the obligation to provide all “material facts” so investors can make “informed consent.” Omissions or misrepresentations can lead to charges of fraud. Material facts are anything that could influence an investor’s decision to invest, such as whether the issuer has criminal convictions, a recent bankruptcy or other failed investments. Exempt Securities Offering documents typically include a Private Placement Memorandum, a Subscription Agreement, Securities Notice Filings and the Investment Contract. Investors often don’t want to know they are selling securities (many are in denial), because they have heard that the rules are complex or that it’s too expensive to draft the offering documents. Most people who don’t follow securities laws either don’t know about them or they have convinced themselves that securities laws don’t apply to them (in denial). The truth is that the consequences of non-compliance with securities laws are steep and simply not worth the risk. Securities litigation fees can rapidly approach six figures, in addition to steep fines that could be imposed by regulators, or in the worst cases, jail. Further, if you want to take your company to a higher level, where you are not dependent on just a few investors, you need to have a securities offering so that you can be in control of the investment. Securities offering rules (e.g., Rule 506 and Regulation A+) can actually help you grow your business. They may allow you to have an unlimited number of investors and raise an unlimited amount of money. And with the new crowdfunding rules, you may even be able to advertise your offering with limited restrictions. So what if you are selling joint ventures? A joint venture is “an undertaking between two individuals or companies for the purpose of carrying out a particular project.” Another name for a joint venture is a general partnership. Joint ventures can range from simple to complex. In a simple joint venture, two or more individuals or companies may combine resources (money, labor or skills) to accomplish a common goal, such as buying and rehabbing a house or forming an entity that acts as the manager of a company raising money via a securities offering (a “syndicate”). A complex joint venture could involve a private equity company or family office and a syndicate combining resources to acquire a large commercial property, where each puts up part of the money for the down payment and closing costs, signs on the purchase loan and shares in management responsibilities. How is this different from an investment contract? In a joint venture, there may be an investment of money (or labor) in a common enterprise with an expectation of profits, but the fourth prong of the Howey Test is missing. The success of the project is not “based solely on the efforts of the promoter” (as in an investment contract) because the investors remain actively involved in management of the project. The downside of this is that everyone is a manager, so no single individual can make decisions on behalf of the group like they can in a company that raises money via a securities offering. Further, investors with jobs may not have the time, inclination or ability to participate in management of a real estate venture. From the practical side, do you really want your physician-investor telling you how to rehab a house or purchase an apartment complex after you’ve invested time and money learning how to do it from experts in the field? 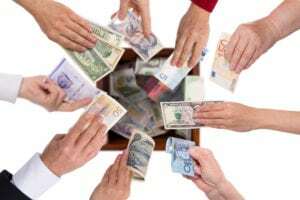 The primary drawbacks to a joint venture are that investor earnings may be taxed at ordinary income rates, and the requirement of active involvement by all participants could preclude self-directed IRA investors (due to prohibited transaction rules). Further, everyone is a manager, so decisions must be made by majority—or perhaps, unanimous—consent. According to Investopedia.com, “it is estimated that nearly half of all joint ventures last less than four years and end in animosity,” generally due to disparities among expectations and contributions of the parties. Typically, joint venture partners all share proportionately in the risks, revenues, expenses and assets related to the project. They also share liability for the acts of each other. This is a burden your investors may not knowingly take on, because they don’t have the time or skill sets to actively participate, or they may not want to take on the liability that comes with being a manager or responsible party in the common venture. The only advantage is that a joint venture requires a more simplified Joint Venture Agreement in lieu of securities offering documents, which may be cheaper to draft initially, but could cost much more later in legal fees and emotional turmoil if the deal turns sour. To maintain a defensible joint venture, all parties must have an active management role in the common project or company. This role must be more than just a right to vote; each should have an actual defined scope of work, and you should be able to demonstrate that they actually did it. Calling someone a joint venture partner and then treating that person as a passive investor is no defense, as it is not what you say, but rather how you run the company that will determine whether you have sold securities or joint ventures. If your investors rely on you to make the profits, it’s a security. If you are not sure whether you are selling securities or joint ventures, you should consult a qualified securities attorney and figure it out. It’s better to be safe than sorry.